There are several answers to that question. 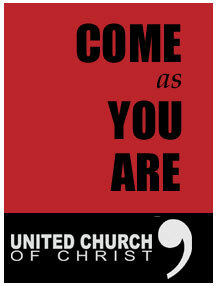 On the UCC website, you can find out Who We Are and What We Believe. You can also read why we believe that God is Still Speaking, as well as some UCC firsts. Our tradition is an open table, meaning all who wish to follow Jesus, to know him as the Christ, are welcome to receive. If you are coming from a church where communion is only received by those who are members of that church or where children wait until after Baptism or Confirmation to receive communion, we respect that your choice may be to not receive.